Robert Lenkiewicz was raised in the Hotel Shemtov in Cricklewood, London, which had effectively become a home for elderly Jews. The influence of such an environment seems to have been profound and not just on Robert: his younger brother John trained as a gerontologist. 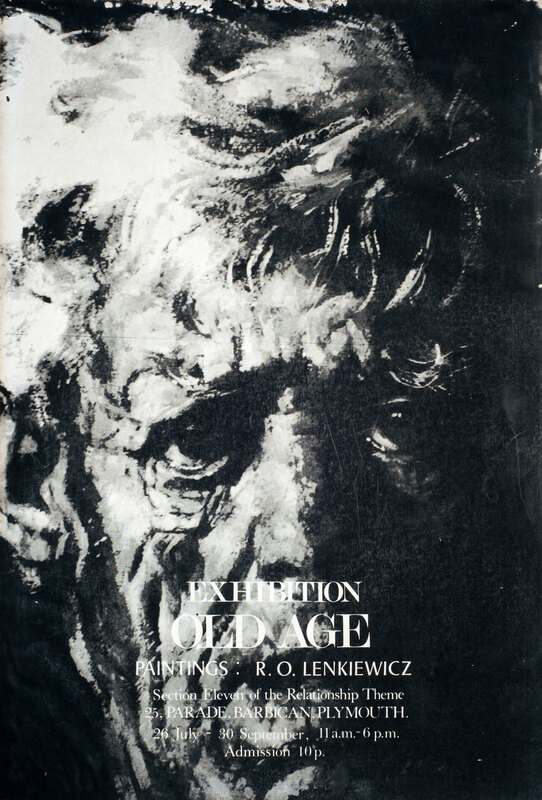 Lenkiewicz’s purpose in the Old Age Project, shown in 1979, was as much to galvanise the elderly themselves as make the general public sympathetically aware of the vicissitudes of age. In Elspeth Sitters, director of the Plymouth branch of the national charity Age Concern, the artist found an open-minded collaborator who permitted him to deliver a lecture on the theme of ‘Geriatrics versus Gerontology’ with an extraordinary twist. Lenkiewicz had himself expertly disguised as an old man by an actor friend, Eliza Massey. Introduced by his brother John, himself a gerontologist, Lenkiewicz teetered onto the stage as ‘Professor Jeremy Jacobson’, concluding his lecture with the most acerbic quotations on old age by Goethe, Freud, and Einstein amongst others; sentiments at great variance with the Age Concern ethos of “a green old age”. Amidst the final applause, Lenkiewicz tore off his disguise, enjoying in a single instant the distinction of being possibly the most popular and the most reviled speaker at such an event in the history of Plymouth Age Concern. “We harden in some places and rot in others; we never ripen.” Sainte-Beuve. “So you managed then, you got by somehow or other? Let somebody else do as much without breaking his neck.” Goethe. “/ am a disgusting object; the flies, oh these flies, they smell a corpse.” Renoir. “The strange thing about growing old is that the intimate identification with the here and now is slowly lost; alone, no hope, no fear, only observation.” Einstein. “An armour of insensitivity is slowly forming around me; I observe it, I do not complain of it. It is a natural evolution, a way of beginning to become inorganic. It is what I believe they call ‘the detachment proper to old age.’ I still cannot get used to the grief and afflictions of old age, and I look forward with longing to the journey into the void.” Freud. “In the ‘monuments to the dead’ that stud my history, it I who am buried.” Simone de Beauvoir. “My diseases are asthma and a dropsy, and what is less curable, 75 years.” Dr Johnson. “You have my acutest sympathy for what you delicately call the ‘nuisance of growing old’. A train has to stop at some station or other. I only wish it wasn’t such an ugly and lonesome place. Don’t you?” Rudyard Kipling. “An old man’s memories are like ants whose ant-hill has been destroyed, one’s eyes cannot follow any single one of them for long.” Mauriac. “There is only one irreparable and cruel evil in life - old age. Life is unbearable and the void is all I hunger and thirst for.” Anatole France. “My past escapes me. I tug at one end, I tug at the other, and all that stays in my hand is a rotten scrap of fraying cloth. Everything turns into a ghost or a lie.” Emmanuel Berl. “Life is like a play, acted at first by live actors and then finished by automata wearing the same costumes.” Schopenhauer. “The heart does not grow old, but it is sad to dwell amongst ruins.” Voltaire. The notebook for this Project is extensive and richly illustrated. The Foundation is currently preparing sections of the notebook for display on this site. No list of exhibited works is availble.